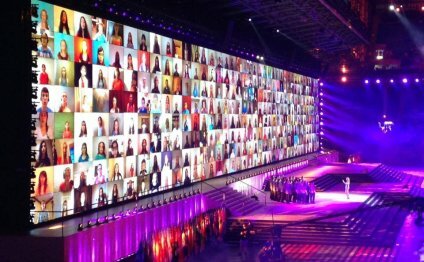 The Virtual Youth Choir, in association with UNICEF, will premiere at the opening ceremony of the Glasgow 2014 Commonwealth Games on Wednesday 23rd July. The event will be broadcast live and webcast. Eric will conduct the Virtual Youth Choir of 2292 singers from 80 countries across the world and the National Youth Choir of Scotland in front of 40, 000 people in legendary Celtic Park stadium and a huge global audience. The choir will sing a special arrangement of “What If” from the musical Paradise Lost . Check out these press releases for more information about the event. What is the Virtual Choir? Whether singing at home, at college, at work or anywhere they can connect to the internet, they record their videos which are synchronised and combined into one single performance to create the Virtual Choir. In 2013, Eric teamed-up with Disney to produce a song, “Glow”, written especially for World of Color – Winter Dreams show which premiered at Disney California Adventure® Park, Disneyland® Resort, Anaheim, California. 1473 singers, representing all 50 American States, submitted recordings, most of which were chosen, to be part of the World of Color Honor Choir.